Root canal therapy is essential for people who have an infection of the dental pulp. The dental pulp is the soft interior part of a tooth that contains the nerves and provides the teeth with nutrients. 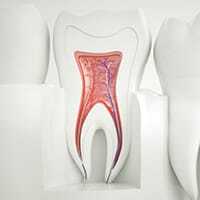 If the dental pulp is damaged or becomes infected, the root nerve can actually die. If left untreated, the tooth will also die and need to be removed. Painful abscesses may also form if the damaged pulp is not properly treated, so while you may not be excited to hear that you need a root canal, this therapy can save a tooth from further damage and also restore your dental health. That's a weight off your mind! During this treatment, your dentist will access the tooth's pulp chamber so that the damaged tissue can be removed. Anesthesia administered before this procedure will ensure that you will experience little, if any, discomfort. We may also medicate the pulp chamber and root canal to prevent further infection. Once the infection has been eradicated, your dentist will permanently seal the treated tooth with a custom dental crown. Depending on the extent of the damage to your tooth, root canal therapy may require more than one office visit.